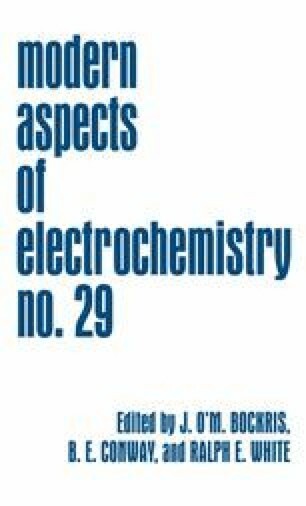 The use of electrochemistry to activate and precisely tune heterogeneous catalytic processes is a new development1-7 which originally emerged due to the existence of solid electrolytes. Depending on their composition, these specific anionic or cationic conductor materials exhibit substantial electrical conductivity at temperatures between 25 and 1000°C. Within this broad temperature range, which covers practically all heterogeneous catalytic reactions, solid electrolytes can be used as reversible in situ promoter donors or poison acceptors to affect the catalytic activity and product selectivity of metals deposited on solid electrolytes in a very pronounced, reversible, and, to some extent, predictable manner.